The Arkansas Razorbacks, also known as the Hogs, are the mascots of college sports teams at the University of Arkansas in Fayetteville, Arkansas. The University of Arkansas student body voted to change the name of the school mascot (originally the Cardinals) in 1910 to the Arkansas Razorbacks after a hard fought battle against LSU in which they were said to play like a "wild band of Razorback hogs" by former coach Hugo Bezdek. The Arkansas Razorbacks are the only major sports team in the US with a porcine nickname, though the Texas A&M–Kingsville Javelinas play in Division II. The University of Arkansas currently fields 19 total varsity teams (eight men's and 11 women's) in 13 sports, and competes in the NCAA Division I (I FBS in football) and is currently a member of the Southeastern Conference (Western Division). After classes were first held at the university, a contest was held on campus to select school colors. Cardinal (a shade of deep red) was selected over heliotrope, a shade of moderate purple. The first Arkansas football team was formed that same year and was known as the "Arkansas Cardinals". Sometime around the year 2000, the color black began making its way onto Razorback merchandise and eventually some team uniforms. Indeed, for some time, the Collegiate Licensing Company (responsible for all UA licensed gear) touted the university's colors as red and black instead of cardinal red and white. While this has been corrected, many manufacturers of UA related merchandise still make product according to the red and black color scheme. Arkansas merchandise sold at the highest levels in school history during the 2012–13 academic year when royalties through CLC ranked 10th best in the nation. In 1909, the football team finished a 7–0 season, allowing only 18 points on defense and scoring 186 points on offense. College Football Hall of Fame coach Hugo Bezdek proclaimed his team played "like a wild band of razorback hogs". The name proved so popular that it was changed for the 1910 season. The tradition of calling the hogs, "Woo, Pig! Sooie" was added in the 1920s. In 1957, Frank Broyles was hired as the head football coach and served in that position for 19 years. Broyles' team was awarded the 1964 National Championship by the Football Writers Association of America and the Helms Athletic Foundation. At the time, The AP and UPI both awarded the designation before bowl games, and gave the award to Alabama. However, Alabama lost their bowl game to Texas, while Arkansas won theirs against Nebraska. The FWAA and HAF both awarded their national championship designations to Arkansas, who was the only team to go undefeated through bowl games that year. Both the University of Arkansas and the University of Alabama claimed national championships for the year 1964. In 1969, Broyles' team was ranked #2 and played the #1-ranked Texas Longhorns, coached by Darrell Royal, in Fayetteville. The game, known as "The Big Shootout" is perhaps the most notable football game in Razorback history. President Richard Nixon was even in attendance. The Razorbacks led 14–0 until the 4th quarter. Texas scored 15 unanswered points and won the national championship 15–14. After Broyles left coaching and became Athletic Director, he hired Lou Holtz to take over his former position. Holtz served as the head football coach from 1977 through the 1983 season. Under him, the Razorbacks lost a national championship in the Sugar Bowl against Alabama and beat the Oklahoma Sooners in the Orange Bowl, ending their national championship hopes. On 1971, the women's athletic department was formed. On January 1, 2008, the men's and women's athletic departments merged along with a new athletic director. The basketball team rose to prominence in the 1970s now under the coaching of Eddie Sutton and with future NBA star Sidney Moncrief along with Marvin Delph and Ron Brewer, three similarly-sized Arkansas bred guards, known as "The Triplets". The team made a Final Four appearance under him, finishing 3rd by defeating Notre Dame on a last second shot in the now defunct consolation game. In the 1980s, the football team was now coached by Ken Hatfield, and established itself as a powerful running team. The Razorbacks challenged for the SWC title each year and went to the Cotton Bowl Classic twice. Hatfield's teams established excellent regular season records, but had difficulty winning bowl games. In 1990, Broyles led the Razorbacks out of the Southwest Conference and into the Southeastern Conference, setting off a major realignment in college football. In 1995, the Arkansas Razorbacks won its first SEC Western Division Title in football. In 1994, Nolan Richardson's basketball Razorbacks won the NCAA Tournament. His basketball teams challenged for the SEC and national championships regularly during the 1990s, making three trips to the Final Four and two to the championship game while compiling a record of 389–169 (.697) in his 17 years as the head basketball coach. On December 10, 1997, Houston Nutt was hired as head football coach for the Razorbacks (1998 season was his first full season) to replace Danny Ford, who had been head coach since 1993, and the 1998 season was his first full season. Highly sought after as a Little Rock Central quarterback, Nutt had been the last recruit to sign under Broyles, but transferred to Oklahoma State University once when he did not fit Holtz's offensive plans. Soon after Houston Dale Nutt's timely departure, Razorback fans rejoiced as Atlanta Falcons Coach Bobby Petrino called the team. He led the team to a BCS game in 2010 and the school's third 11 win season with a Top 5 season ranking in the 2011 season with a heavy passing attack. On April 1, 2012 Bobby Petrino drove his motorcycle into a ditch with a passenger aboard. He was fired after it was revealed this passenger was his mistress whom he had hired onto his staff. AD Jeff Long introduced John L. Smith as the interim coach for the 2012 season in late April. Smith entered the season as the steward of a pre-season Top 10 squad with multiple pre-season Heisman hopefuls. He recorded the school's first loss to a Sunbelt team in the program's 100-year history as Louisiana Monroe pulled the upset in Little Rock. In only his second game, he had managed the second largest drop from the AP ranking narrowly missing the #1 spot held by Michigan after losing the season opener to Appalachian State just threes years before. On December 4, 2012, the school named former University of Wisconsin coach Bret Bielema as head coach for the 2013 season. Coach Bielema rebuilt the team around a power running game and strong defense and led the team back to a winning record in 2014 including back-to-back shutouts over top ten teams, the first time in history such a feat had been accomplished, and a victory over Texas in the Texas bowl at the end of the season. 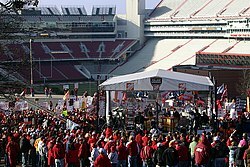 ESPN College Gameday at the University of Arkansas. The football team plays its home games either at Donald W. Reynolds Razorback Stadium, located on the University of Arkansas campus in Fayetteville, or at War Memorial Stadium, located in Little Rock. In 1964, the Razorbacks were the only team to go through the regular season and a bowl game undefeated, and they were awarded the Football Writers Association of America National Championship. The 1969 team, led by quarterback Bill Montgomery, challenged the Texas Longhorns for a national championship in the Game of the Century. On December 6, 2017, Chad Morris was hired as the head coach, replacing Bret Bielema after five years. The basketball team plays its home games in Bud Walton Arena on the University of Arkansas campus. One of the top 10 NCAA programs of all time, the Razorbacks were ushered into the modern era on the shoulders of Coach Eddie Sutton (800 game winner). Under the leadership of Nolan Richardson, the Razorbacks won the NCAA tournament in 1994 defeating Duke University, and appeared in the championship game the following year, but were beaten by UCLA. The Razorbacks have been to NCAA Final Four in 1941, 1945, 1978, 1990, 1994 and 1995, though the first two were achieved before the NCAA gathered the final four teams in one site. The current head coach for the men's basketball team is Mike Anderson. The former assistant under Nolan Richardson has returned to Arkansas. On March 26, 2007, Stan Heath was fired as the head coach of the men's basketball team. John Pelphrey ultimately replaced Heath and made the 2008 NCAA Men's Division I Basketball Tournament, but did not make any subsequent postseason appearances and was fired after the 2010–11 season. Pelphrey compiled a 69–59 overall record and 25–39 SEC conference record while at Arkansas. Mike Anderson was announced as the new men's Basketball head coach on March 23, 2011. Bo Bigham bats for the Razorbacks at the 2012 College World Series. The baseball team, led by former Razorback Dave Van Horn, has reached the post-season NCAA tournament every year except one (2016) since he began coaching the team in 2003. In 2012, they reached the College World Series compiling a 2–0 record in Omaha before falling in consecutive games to two time defending national champion South Carolina in the championship of Bracket Two. South Carolina was defeated in the National Championship Series by Arizona. The Razorbacks most recently also reached the 2018 College World Series where they finished runner-up to Oregon State, joining previous appearances in Omaha in 1979 (finished runner-up); 1985; 1987, 1989, 2004, 2009, and 2015. The team plays home games at Baum Stadium, located just south of campus and which finished several major renovations in 2004 and 2009. Many Razorbacks players have gone on to the majors, perhaps the most successful is Cliff Lee, the 2008 AL Cy Young Award Winner, with the most recent being Dallas Keuchel of the Houston Astros. The track and field team was under the direction of John McDonnell for over 25 years (since the 1977–78 academic year). McDonnell's men's teams have won 40 NCAA championships since 1984, including 11 cross country, 19 indoor track and 10 outdoor track along with 37 Southwest Conference Championships, and 38 of 40 SEC titles. The Razorbacks, under his direction, won five National Triple Crowns, achieved by winning NCAA titles in cross country, indoor and outdoor track in the same school year. Arkansas and the University of Texas-El Paso (UTEP) are the only teams to have ever won the National Triple Crown. The track and field Razorbacks men completely dominated the sport during the 1990s, winning 24 of the 30 available titles. Now under the direction of coaches Chris Bucknam, Doug Case and Travis Geopfert, the men's track and field team still dominates the NCAA. They have won multiple triple crowns along with one national championship since taking over in 2008. The Razorbacks golf teams are based at The Blessings golf course in Fayetteville. From the back tees of the course, the rating is 79.1 and its slope is 153, making it one of the most difficult golf courses in the U.S. The men's golf team has won two conference championships: 1958 Southwest Conference and 1995 Southeastern Conference. R. H. Sikes won the NCAA Championship in 1963 and the team place second in 2009. Razorback Women during a basketball game. The Razorback women's basketball team plays home games in Bud Walton Arena, often referred to as the "Basketball Palace of Mid-America." The building is located on the University of Arkansas campus. The women's basketball team completed its 39th season in 2014–15, and has made 21 post season appearances (from AIAW through the current NCAA era). The Razorbacks' made their first NCAA Women's Final Four appearance in 1998, with the help of team leader Christy Smith. The cross country track team is led by head coach Lance Harter. They practice (and compete) on Agri Park cross country course (so named because it is located on the on campus agricultural area). Agri Park is also home to the men's cross country team. Harter is the first Arkansas coach to have his team ranked No. 1 in the nation, and has won more SEC cross country titles than any other member institution. The golf team is headed by coach Shauna Estes-Taylor. The team practices both at Blessings course, which is located a few minutes from the University of Arkansas campus in Johnson, Arkansas, and also at the Fred W. and Mary B. Smith Razorback Golf Training Facility—which is also located at Blessings course—which features both indoor and outdoor practice areas. The men's golf team utilizes both areas as well. The gymnastics team is referred to as the Gym'Backs. They are head coached by Mark Cook. They practice in the Bev Lewis Center for Women's Athletics and compete in Barnhill Arena, both of which are located on the University of Arkansas campus. The Gym'Backs have five NCAA Regional appearances (2004, 2005, 2006, 2007, 2008), advanced two individuals (Dana McQuillin and Casey Jo Magee) to the NCAA Championship and hosted the 2006 NCAA South Central Regional. At the 2006 Regionals, the Gym'Backs placed second in a six-team field, qualifying them for the NCAA National Championships for the first time. They repeated this feat in 2008. Also in 2008, team members Michelle Stout and Casey Jo Magee, became the Gym'Backs first All-Americans. Stout reached first-team status on vault while Magee became a two-time second-team member on vault and uneven bars. The soccer team is head coached by Colby Hale, and practice/play on Arkansas Field which is an exclusively soccer field on campus. Arkansas soccer is one of the oldest programs in the Southeastern Conference, competing as a varsity sport since 1986. The softball team is coached by Courtney Deifel. They practice and play at Bogle Park, which opened during the 2008–09 season. The swimming and diving team is coached by Sean Schimmel. The team's facilities are the University of Arkansas Natatorium, which is located inside the HPER building (which also is home to student intramural facilities). The tennis team's head coach is Michael Hegarty. The team's facilities are the Billingsley Center (outdoor) and the adjacent Dills Indoor Tennis Center. Tennis is one of the oldest varsity sports at Arkansas with a continuous history from the first year of the Women's Athletics Department in 1971–1972. The track and field team is coached by Lance Harter. They have indoor facilities at The Randal Tyson Track Center and outdoor facilities at John McDonnell Field. Harter's teams are the most successful in the Southeastern Conference, winning 16 league titles including the first-ever SEC women's triple crown (a sweep of cross country, indoor and outdoor titles in the same season). His program produced numerous NCAA champions and most recently Athens Olympics medalists Veronica Campbell (two gold medals and a bronze for Jamaica in sprints) and Deena (Drossin) Kastor. Kastor is one of America's premier distance runners, earning a marathon bronze medal in Athens and holding numerous distance and marathon records. The volleyball team is coached by Robert Pulliza. They practice and play in Barnhill Arena. Before Pulliza took over for Chris Poole in 2008, Poole's teams had won 11 SEC Western Division from their inaugural season in 1994. Founded in 1971, the University of Arkansas Rugby Club is the longest tenured sports club on campus. Arkansas plays college rugby in the Division 1 Heart of America conference, a conference composed mostly of Big 12 and SEC teams. The team plays at Walker Park, just south of the Donald W. Reynolds Stadium. Arkansas rugby is led by head coach Warren Fyfe. Arkansas has consistently been one of the best teams in the Heart of America conference, winning the conference title in the 2009–10 and 2010–11 school years, and finishing second in 2011–12. Arkansas defeated Kansas 28–12 to reach the finals of the 2012 Heart of America 7s tournament, where they lost to Lindenwood. The Razorback hockey program was founded in 2007 as a club team playing in the ACHA's Division III. Playing their first full season in 2008–09, the Hogs posted a 6-6-0 record in the SECHC: since then, the team has yet to record a losing season, with five SECHC titles in their history. This success allowed the first team to move up to ACHA Division I in 2015–16, playing in the WCHL: a second team was added by the club that remains in DIII and the SECHC. Home games are played at the Jones Center Rink in nearby Springdale and attract large crowds, reflecting the growth in popularity of hockey in Northwest Arkansas. The club's biggest rival is Missouri State: the Razorbacks and Ice Bears DI teams play an annual home-and-away series, with great attendance at both venues. The University of Arkansas Cycling Club is one of the fastest growing sports clubs on campus. For the past five years, Arkansas Cycling Club has hosted its annual cycling event, the Arkansas Classic, which attracts collegiate and non-collegiate cyclists from over 10 states, some from as far as Minnesota and Wisconsin. The club represents the university in the South Central Collegiate Cycling Conference (SCCCC), competing against teams from Texas, Oklahoma and Louisiana. Arkansas Cycling competes in most disciplines of cycling, especially Road and Mountain at the local, state, regional and national levels. For the past three years, the club has sent multiple riders to the Collegiate National Championships, which in 2017 will be hosted in Grand Junction, CO. Inside the state of Arkansas, the University of Arkansas has continued to maintain the policy of not competing against other in-state Division I schools. There are four other Division I schools in the state of Arkansas: Arkansas State University in Jonesboro, the University of Arkansas at Little Rock (athletically branded as "Little Rock"), University of Arkansas-Pine Bluff, and the University of Central Arkansas in Conway. ASU is the only school of the three to compete in the Football Bowl Subdivision; Little Rock does not have football, while UAPB and UCA compete in the Football Championship Subdivision. Historically, Arkansas' most heated rivalry was with the Longhorns of the University of Texas. However, the rivalry has become much less intense since the two teams joined different conferences in the early 1990s and now meet up infrequently. Texas leads the series in football and baseball, while Arkansas holds the series lead in basketball and track & field. Another rival from the state of Texas is Texas A&M. During their Southwest Conference rivalry days, the two teams played annually in all sports. In 2009, the rivalry resumed again on an annual basis, being played each year at Cowboys Stadium. (see Arkansas–Texas A&M rivalry) The rivalry in all other sports resumed in the fall of 2012 after A&M joined the SEC. Since joining the Southeastern Conference the Razorbacks have developed a rivalry with Louisiana State University (LSU Tigers) in football. The game between these two teams usually takes place near the end of the season and has sometimes decided the SEC Western Division Championship. The winner of this game takes home the "Golden Boot" which is a gold trophy in the shape of the two states. Arkansas took the Golden Boot home in 2007 with a 50–48 win over the #1 ranked Tigers in Baton Rouge. This was their first time winning the trophy since 2002. Arkansas and LSU have also built a rivalry in baseball, as the two schools have been at the top of the NCAA attendance standings for the past several seasons. In 2001, despite coming into the series in last place in the SEC West, Arkansas swept a three-game series from top-ranked LSU, which won the 2000 College World Series, in Fayetteville. In basketball, the primary rival for the Razorbacks in the SEC are the Wildcats of the University of Kentucky. This rivalry developed in the 1990s during the coaching tenures of Rick Pitino at Kentucky and Nolan Richardson at Arkansas when both Kentucky and Arkansas were annually in competition for a national title. Boss Hog entertains fans at a basketball game in 2010. The live mascot for the University of Arkansas is named Tusk. He is a Russian boar that weighs in at approximately 400 pounds. Tusk currently resides on the Stokes family farm in Dardanelle, Ark., and makes a two-hour trek up to Northwest Arkansas for every Razorback football game. The currently mascot, Tusk IV, is a direct descendant of Tusk I. The live mascot program at Arkansas is supported by the Tusk Fund, which is administered by the Razorback Foundation. There are a number of costumed mascots for the University of Arkansas Razorbacks that attend most major sporting events. Big Red (aka the "Fighting Razorback") is the traditional mascot for the university and represents the intimidating fighting spirit of the Razorbacks at all athletic events. Sue E., is the female hog and is famous for her costume changes and dancing ability. Pork Chop is the "kid" mascot. 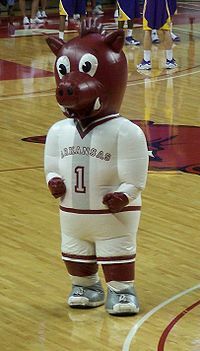 Boss Hog, a nine-foot inflatable mascot, joined the mascot family during the 1998–99 football season. The Razorback was officially adopted as the university's mascot in 1909 after Hugo Bezdek, the coach at the time, stated after a big win that his team played like a "wild band of razorback hogs". Subsequently, the razorback became the mascot for the entire university, replacing the cardinals as the official mascot. The only current athletic logo for the university is the classic or running hog as has been depicted on the program's football helmets. The university has ceased manufacture of memorabilia with any of the other logos in an attempt to re-brand the athletic department. Arkansas has won 45 NCAA team national championships. Arkansas' 1964 football team was recognized contemporaneously as the national champion by the Football Writers Association of America, Helms Athletic Foundation and Poling System, and retroactively by the College Football Researchers Association, Billingsley Report, National Championship Foundation, and Sagarin Ratings. The NCAA does not name an official Division I football champion. Joe Adams – played for the Carolina Panthers. Fred Akers – former head coach at University of Texas. Lance Alworth – played for the San Diego Chargers. Pro Football Hall of Fame and College Football Hall of Fame member. Gary Anderson – USFL and NFL running back. Shawn Andrews – plays for the Philadelphia Eagles. Steve Atwater – played for the Denver Broncos. Won two Super Bowls and elected to eight Pro Bowls. Jim Benton – played for the Cleveland Rams, Chicago Bears, and Los Angeles Rams in the 1930s and 1940s. Member of the NFL 1940s All-Decade Team. John Bond – offensive coordinator for the Georgia Tech Yellow Jackets football team. William "Bud" Brooks – All American and winner of the Outland Trophy for the nation's best interior lineman in 1954. Frank Broyles – played football at Georgia Tech for Coach Bobby Dodd, but as coach found success throughout the 1960s. Under Broyles, Arkansas claimed the 1964 national championship. After retiring from coaching in 1976, has been well known as the Arkansas men's athletic director (1974–2007) and a broadcaster for ABC Sports. Member, College Football Hall of Fame. Fred Childress – six-time all star offensive lineman in the CFL. Greg Childs – played for the Minnesota Vikings. Butch Davis – NFL and college head coach. Joe Ferguson – played for the Buffalo Bills. Barry Foster – played for Pittsburgh Steelers. Ken Hamlin – played for the Dallas Cowboys. Dan Hampton – played for the Chicago Bears. Pro Football Hall of Fame member. Dave Hanner – member of the Green Bay Packers Hall of Fame. Ken Hatfield – member of the 1964 national championship team at Arkansas He went on to be the head football coach at the Air Force Academy, the University of Arkansas, Clemson University, and Rice University. Wayne Harris – member of the Canadian Football Hall of Fame. Hunter Henry - Tight End for the Los Angeles Chargers. Madre Hill – played for the Cleveland Browns, Berlin Thunder (NFL Europe), San Diego Chargers, Oakland Raiders and in Super Bowl XXXVII. Considered one of the greatest running backs to come out of the University of Arkansas. Red Hickey – NFL player and head coach; credited with creating the shotgun formation. Peyton Hillis – Former NFL Running Back, Madden 12 cover athlete. Jim Lee Howell – NFL player and head coach. John Jenkins – head coach for University of Houston and in the Canadian Football League. Jimmy Johnson – member of the 1964 national championship team at Arkansas. He went on to be the head football coach at Oklahoma State University, the University of Miami, Dallas Cowboys, and the Miami Dolphins. Jerry Jones – member of the 1964 national championship team at Arkansas. He is the owner of the Dallas Cowboys. Matt Jones – first-round draft selection of the Jacksonville Jaguars. Jones also played for the Razorbacks in basketball. Kenoy Kennedy – played for the Detroit Lions. Steve Little – one of top college kicker/punter combos, kicking an NCAA record 67-yard field goal in 1977. Played for St. Louis Cardinals. Jonathan Luigs – All American and 2006 winner of the 2006 Dave Rimington Trophy given to the outstanding center in the U.S.
Ryan Mallett – Former Backup quarterback for the New England Patriots, Houston Texas, and Baltimore Ravens currently a free agent. Darren McFadden – winner of 2006 and 2007 Doak Walker Award, 2006 and 2007 Heisman Trophy runner-up and winner of the 2008 Walter Camp college football player of the year award. 2008 first round draft pick of the Oakland Raiders. Marcus Monk – played for the Chicago Bears, New York Giants, and Carolina Panthers. Bill Montgomery- member of the University of Arkansas Sports Hall of Honor and QB during the 1969 Big Shootout. Jason Peters – Starting Offensive lineman for the Philadelphia Eagles. Loyd Phillips – member of the College Football Hall of Fame and 1966 winner of the Outland Trophy for the best interior linemen in the country. Billy Ray Smith, Jr. – first round draft selection in 1983 draft; played for the San Diego Chargers, 1983–1992. Inducted into College Football Hall of Fame. Pat Summerall – played ten years in the NFL, primarily as a kicker; best known as a broadcaster, gaining prominence with his partner John Madden. Barry Switzer – member of the 1964 national championship team at Arkansas He went on to be the head football coach at the University of Oklahoma and for the Dallas Cowboys. Dennis Winston – defensive lineman for the Pittsburgh Steelers and New Orleans Saints. Jarius Wright – plays for the Minnesota Vikings. John Adams – 1941 All-American and one of several individuals credited with inventing the jump shot. Ron Brewer – drafted by the Portland Trail Blazers in the first round (7th pick) of the 1978 NBA draft. Played eight years in the league for six teams. Ronnie Brewer – son of Ron Brewer. First-round NBA draft choice of the Utah Jazz in 2006. Shameka Christon – Plays for WNBA's New York Liberty. Marvin Delph – one of the "triplets" was drafted but never played in the NBA choosing to play for Athletes in Action, a Christian ministry. Joe Johnson – drafted by the Boston Celtics 10th overall in 2001. Traded to the Phoenix Suns. Played for the Atlanta Hawks, and now a member of the Brooklyn Nets. Joe Kleine – played 15 years in the NBA for the Chicago Bulls and five other teams. Was a gold medalist on the 1984 U.S. Olympic basketball team. Lee Mayberry – played seven years in the NBA for both the Milwaukee Bucks and Vancouver Grizzlies. Sidney Moncrief – played for Milwaukee Bucks. Two-time NBA Defensive Player of the Year. Jannero Pargo – guard for the New Orleans Hornets. R. C. Pitts – gold medalist at 1948 Summer Olympics. Ulysses (U.S.) Reed – hit the half-court buzzer-beating shot to sink defending champion Louisville during the 1981 NCAA Tournament. Kareem Reid – played for the Harlem Globetrotters. Alvin Robertson – played for San Antonio Spurs. Was a gold medalist on the 1984 men's U.S. Olympic basketball team. Named NBA Defensive Player of the Year and Most Improved Player in 1986. Scotty Thurman – key to the 1994 NCAA Championship team and known as the player that hit "The Shot", a three-point basket with approximately 53 seconds left, in the 1994 Championship game versus Duke University. Darrell Walker – played for several NBA teams including the champion Chicago Bulls. Formerly head coach for Toronto Raptors and Washington Wizards. Sonny Weems – winner of the NCAA slam dunk competition and 2008 NBA draft pick (second round-39th overall) of the Chicago Bulls and then traded to the Denver Nuggets. Corliss Williamson aka "Big Nasty" – played for Sacramento Kings, Toronto Raptors, Detroit Pistons (with whom he won the NBA title in 2004), and Philadelphia 76ers. Returned to Sacramento in 2005. Named 2001–2002 NBA Sixth Man of the Year. He led the Hogs to 1994 NCAA Championship, where he was named Most Outstanding Player of the NCAA Tournament. Cliff Lee – played for the Texas Rangers, 2008 American League Cy Young Award Winner. Now plays for the Phillies again after signing a 5 yr deal on December 15, 2010. Dallas Keuchel – Currently plays for the Houston Astros, 2014 Gold glove winner and Field bible winner. Stacy Lewis – NCAA individual champion, 2007. Won individual and team championship at 2006 World Student Games. Finished 3rd in 2008 Women's U.S. Open, her professional debut. Niall Bruton – Two-time winner of NCAA indoor mile, Irish Olympian. Veronica Campbell-Brown – Won three gold medals and a bronze in two Olympic Games competing for Jamaica in sprints. Won 100 meter and second in 200 meter at 2007 World Championships. Alistair Cragg – Top Irish distance runner. Calvin Davis – Won bronze medal in 400 meter hurdles at 1996 Summer Olympics. Joe Falcon – US's top miler in 1990. Edrick Floreal – Canadian Olympic triple jumper, head coach at Stanford. Tyson Gay – Won 100 and 200 meter sprints at 2007 World Championships. Matt Hemingway – Silver medalist in high jump in 2004 Olympic Games. Robert Howard – Two-time Olympic participant. Won nine NCAA titles in triple and long jumps. Deena Kastor – Holder of the US marathon record. Won bronze medal in Olympic marathon in 2004. Seneca Lassiter – Among top American milers, winning USATF 1500-meter run twice. Jarrion Lawson – 2016 winner of The Bowerman. First since Jesse Owens to sweep the 100, 200, and long jump in the same NCAA championship. Daniel Lincoln – US Olympian and American record holder in the steeplechase. Frank O'Mara – Two-time 3000 meter indoor world champion. Gi-Gi Miller-Johnson – Top heptathlete in US in 2006. Brandon Rock – 800 meter runner; 1996 Summer Olympics, 1995 USATF National Champion, 1995 NCAA Outdoor Championship. Jérôme Romain – Top triple jumper who represented Dominica and France, winning the bronze medal at 1995 World Championships. Currently coaching at Brown University. Clyde Scott – Silver medalist in 110-meter hurdles at 1948 Olympic Games. Played in NFL. Wallace Spearmon, Jr. – 200 meter silver medalist at 2005 World Championships and bronze medalist at 2007 World Championships. Erick Walder – 10-time NCAA long jump and triple jump champion. Silver medalist in long jump at 1997 World Championships. Brian Wellman – World class triple jumper who represented Bermuda internationally, winning a silver medal at 1995 World Championships. Godfrey Siamusiye – Two-time Olympic distance runner and two-time NCAA Cross Country National Champion in 1995 and 1996. Katherine Grable – 2014 NCAA Champion on Vault and Floor. Second in the All-Around at the NCAA Event Finals. ^ "Arkansas to merge men's, women's programs". ESPN.com. November 15, 2007. ^ Voigt, Kurt (December 6, 2017). "Arkansas hires SMU's Chad Morris as new football coach". USA TODAY. Retrieved March 11, 2019. ^ "Despite 20 wins this season, Arkansas fires Heath". ESPN. March 26, 2007. Retrieved April 27, 2012. ^ "Arkansas fires coach John Pelphrey". ESPN. March 14, 2011. Retrieved April 27, 2012. ^ "The Texas Rangers May Trade Kevin Millwood, But They're Giving Away Holiday Cheer." Article. Dallas Observer. Retrieved on December 13, 2009. ^ This count does not include two outdoor track championships that were vacated by the NCAA (2004 and 2005). ^ "Arkansas 2012–2013 Men's Golf" (PDF). Retrieved June 26, 2013. ^ a b "W. Basketball Program History". May 18, 2015. ^ "2008 Arkansas Razorbacks Soccer". ^ "Cycling - University of Arkansas". urec.uark.edu. ^ Hall, Wally (October 15, 2006). "Like it is : Arkansas-ASU would have to be better than this". Arkansas Democrat-Gazette. Archived from the original on October 15, 2006. Retrieved April 26, 2016. ^ Bahn, Chris (September 27, 2012). "Now Red Wolves Vs. Razorbacks Debate No Longer Confined To Offseason Radio". Arkansas Business. Archived from the original on September 30, 2012. Retrieved December 10, 2017. ^ "Ticket Office Information". January 24, 2015. ^ MacCambridge, Michael (September 1, 2005). ESPN College Football Encyclopedia: The Complete History of the Game. ESPN. ISBN 1401337031. ^ "The Razorback". University of Arkansas. Retrieved April 27, 2012. ^ "USATF - Hall of Fame". www.usatf.org. ^ "Jarrion Lawson Wins The Bowerman ::: The Bowerman: The Nation's Top Award for Collegiate Track & Field Athletes". The Bowerman. Retrieved December 31, 2018. ^ "Virginia "Gi-Gi" Miller-Johnson". USA Track & Field. Archived from the original on January 21, 2009.